More than half the world's people live in coastal regions, utilizing such resources as salt, minerals, fish, and crustaceans, the products of mangroves, salt marsh, seagrass, and kelp, energy from wind, waves, and tides, and such materials as sand, gravel, clay, and limestone, all obtained from the coast or the adjacent sea. Moreover, the coast provides sites for settlement, agriculture and aquaculture, ports and harbours, industry, commerce, and recreation. The management of coastal environments and their resources has raised many problems in both developed and developing countries, and it was felt appropriate that the United Nations University should give emphasis to this field of study. The Coastal Resources Management Project was initiated as part of the University's Natural Resources Programme. It was decided that the coastal environment - comprising the foreshore (between high and low tide lines), backshore (above high tide line to the landward limit of marine influences), and nearshore (from low tide line out to a depth of 20 metres) zones was a distinctive field for research and training that merited its own project within the programme. A number of research studies and workshops were commissioned under this theme. 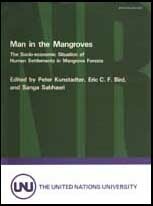 Man in the Mangroves contains papers presented at a UNU-sponsored workshop. Three of the papers result from UNU research. The remainder were submitted by independent researchers. They focus on the socio-economic aspects of the use, development, and management of mangrove areas in relation to environmental and ecological factors. Although the Coastal Resources Management Project has now been concluded, the University's new programme on Resource Policy and Management has undertaken to maintain an international dimension in research, training, and dissemination, stressing the interaction of resource management, conservation, and development.